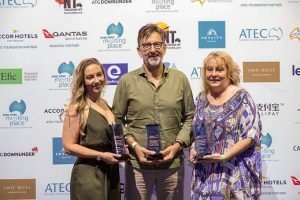 Australia’s export tourism industry has recognised the outstanding contribution of its leaders at the annual Australian Tourism Export Council (ATEC) Excellence Awards held at the Darwin Convention Centre on Wednesday night. The awards recognise the most outstanding contribution of an individual, young achiever of the year and other outstanding industry commitment, with this year’s Captain Trevor Haworth Outstanding Contribution by an Individual to the Tourism Export Industry won by North Queensland’s James Dixon from Down Under Tours. “James is a true industry leader, having dedicated many years of service to a vast array of industry bodies from his local ATEC branch, the board of Tourism & Events Queensland, the FNQ Tour Operators Association and the Alliance for Sustainable Tourism,” ATEC Chairman Denis Pierce said. The Len Taylor Young ATEC Award for Leadership for 2018 was awarded to Bridget Beddgood, from Hamilton Island who has been Instrumental in rebuilding the NSW ATEC Branch events schedule. “As NSW Chair of YATEC and a participant in our ELITE Program, Bridget is dedicated to encouraging her peers to get involved with YATEC. This year’s Outstanding Contribution by an Individual was awarded to Tourism Western Australia’s Kelsie Johnston who has helped build a strong and productive relationship between the STO and ATEC and was a key driver in securing ATEC’s Meeting Place event held in Perth in 2017. “Kelsie was instrumental in establishing the first STO partnership for ATEC’s BRITE program and encouraged numerous WA products to engage with the program, helping them to become trade and export ready. ATEC’s Branch of the Year was awarded to Western Australia. “Congratulations to all this year’s award winners. You are the people who work each day make our industry vibrant and successful,” Mr Pierce said.